Hey there! Something amazing happened to me last week... 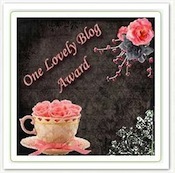 I received the One Lovely Blog Award from Maria at Kinder-Craze! I am extremely excited about receiving this award... it's such an honor. 3. Michele and Amber at C.E. Kindergarten Kids! 4. Sarah at Yeehaw Teaching in Texas! 5. Dani at Just Another Day in 2nd Grade! 10. Miss Brown at Teaching is a work of Heart!!! 14. Mrs. Kerola at Happy Literacy! Wow!!! Thank you so much, you've totally made my day! So sweet of you to think of me, I really appreciate the blog award! Have a great day! Thanks for the award. I am new to this blog thing and have no idea what any of this means. I am you newest follower!